A southern drama about a small town simmering with social tensions, The Chase promises much and offers a cast filled with talent. But it stays in the oven for too long, emerging as an overcooked and tough to chew mess of a meal. In deep rural Texas, convicted criminal Bubber Reeves (Robert Redford) has busted out of prison and is on the run. News of the escape reaches the nearby small town where Bubber was born and raised, and the townsfolk are immediately thrown into a frenzy of anxiety and anticipation. Businessman Val Rogers (E.G. 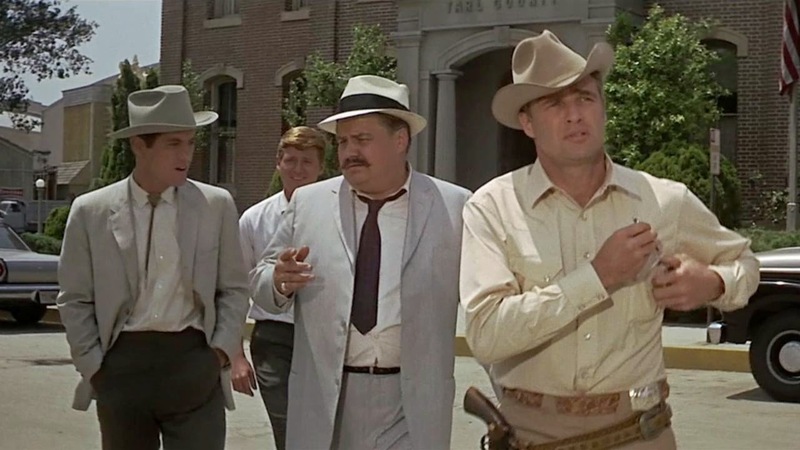 Marshall) pretty much owns the town and likes to think that he controls everything and everyone in it, including Sheriff Calder (Marlon Brando). Val's son Jake (James Fox) is the heir apparent to his father's empire, and is trapped in a marriage of convenience to Elizabeth (Diana Hyland), while carrying on an open affair with Anna Reeves (Jane Fonda), Bubber's lonely wife. Meek banker Edwin Stewart (Robert Duvall) desperately wants to be part of Val's inner circle, but his wife Emily (Janice Rule) is tired of waiting for Edwin to make something of himself. She is having an affair with the seemingly more presentable but equally married Damon Fuller (Richard Bradford). Fuller is part of a group of gun-toting men who believe themselves to be above the law and almost openly disrespect Sheriff Calder's authority. Over the course of one day and one night, Bubber edges ever closer to the town, emotions boil over, and Calder and his wife Ruby (Angie Dickinson) find themselves increasingly isolated as they try to keep a lid on a town about to explode. Early on it becomes clear that there is not much chasing going on in The Chase. Directed by Arthur Penn (who later disowned it) and produced by Sam Spiegel, the film enjoys some moments and benefits from a remarkable cast in good form. But the ambition overreaches the narrative premise, and the film gets caught spinning in place. The Lillian Hellman script (heavily doctored by Spiegel) tries to create a tense boiling pot of a town galvanized by the wait for a dangerous criminal, but the attempt is only partially successful. The story gets into trouble early. To start, there is little that is dangerous about Robert Redford as Bubber Reeves, who is portrayed as more of a victim than a criminal. With his perfectly coiffed hair catching the light just so in the Texas wilderness and his good boy looks betraying any attempt at evil, the threat that is supposed to exist at the centre of the film dissolves in Redford's substantial star charisma. In the town itself, there are just too many unsavoury characters making life miserable for each other. Most of the residents appear to be carrying on extramarital affairs, while the prevailing agony, bitterness and resentment is in keeping with the mean spirited nature of a community rife with vigilantism, classism and racism. They all appear dissatisfied and wretchedly unhappy, and they all seem to deserve it. The sheer number of minor characters causes the film to lose momentum. There are snippets of numerous sub-stories including Bubber's parents; a religious old woman who putters around town; another elderly couple; a gaggle of teenagers; and a land owner/loan shark who serves as the perpetual interested observer. None gain traction and all get in the way, to the point that at a climactic moment late in the film, it's not even unclear which tertiary character pulled the critical trigger. In the middle of the over-ripened fruit Sheriff Calder and his wife Ruby are an oasis of goodness, and The Chase gradually veers towards traditional one-good-man-against-a-bad-town territory. Bubber almost turns into a MacGuffin, a catalyst to trigger a story of the lawman confronting the corruption that lurks within. 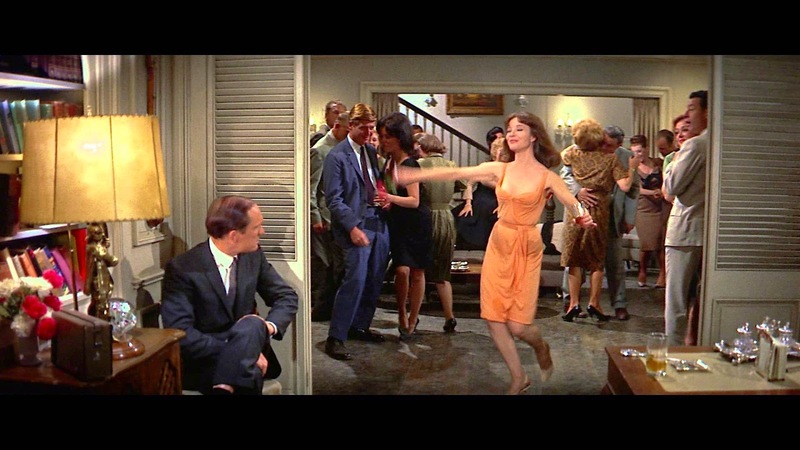 And whenever Brando or Dickinson are on the screen, The Chase picks itself up and does much better, Brando ironically bringing a laconic intensity to the only likeable character in the film, while Calder and Ruby appear to enjoy the only rational relationship in this forgotten corner of Texas. In the film's most memorable scene, Penn practices playing with bucketfuls of blood (a skill he would put to good use in 1967's Bonnie And Clyde) by subjecting Brando to a vicious beating at the hands of the town's gun-happy vigilante men. It's an excessive sequence, in keeping with the overheated tone of why stop at a single punch when ten will do. The Chase is tolerable fare, with enough going on to maintain interest but too much going on to gain and maintain focus.